Pan (Charles) here again -- still doing abbreviated log entries since we have fallen behind. Our ability to upload is more limited than I'd guessed -- but that's okay. Meanwhile our days are long and tiring, so we frequently fall asleep with journal entries only minimally entered. We resupplied our food at (can you believe it?) KMart -- from four aisles of groceries. Ugh. Chris (Dionysus) and Sean (Sidekick) didn't do too badly, but my choices were really bad. So I ended up with stuff like M&Ms and Cheez Whiz. (Yes, it's a sign of the Apocalypse. Charles Doersch has bought and eaten Cheez Whiz). A wonderful trail angel in Tehachapi came and provided us transportation to the Post Office to pick up our new pads, to the gear store for odds & ends, and to the Del Taco for lunch, before leaving us off at Willow Springs Road to continue the trail. It was late in the day by the time we arrived there, so we wouldn't make many miles. What a wonderland of wind farms we hiked through. Windy day, too. Tehachapi is the windiest area I've ever been in -- I mean, consistent windiness. But what a strange, science fiction landscape of whirling huge blades all around us, and they were all over. Up across the hills. Filling valleys. Lined up on ridge line after ridge line. Gajillions of flashing whirling blades towering above and all around us. These are 40 or 50 feet tall. Huge! The sky was alive with whirling 3-story blades. Wowie! 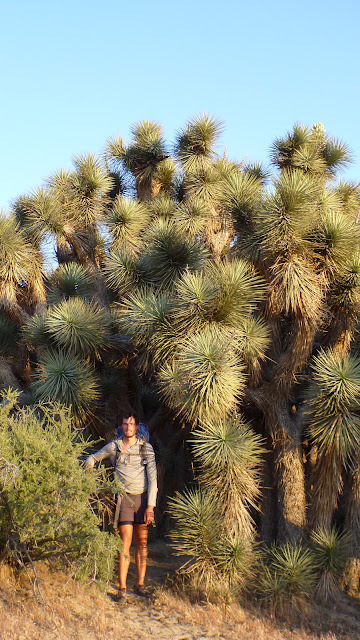 Dionysus has discovered room for a single sleeping bag inside this grove of Joshua Trees (needles all around). No good. We zigzagged down through sandy hills where cattle had obscured our trail -- and ended up down a wrong valley with clusters of Joshua trees in the basin. We quickly found our track, though, and continued down. The trail merged onto a dirt road called Cameron Rd. Our daylight was getting low as we came down that empty lonely road toward a roaring highway with big rigs blaring and engine braking down the mountain -- and then trains -- one after the other zooming up the valley right next to the highway; as we approached, Cameron Rd crossed the railroad tracks then turned sharply east fronting Highway 58 (Bakersfield-Barstow Hwy) and the tracks. As if the Cheez Whiz wasn't sign enough that we have officially entered the ranks of true "hiker trash," we ended up setting out our sleeping bags in a sandy culvert (ditch) between the highway and the train tracks. Chris (Dionysus) passed the tequila around (which helped soooo much), and we journaled and read a little. Camping in a ditch beside a highway and a railroad. I put in earplugs. But what a surreal night of big rigs with all their running lights whirling past us -- seemingly right next to us (like camping on the planet Coruscant) -- and ten different gigantic freight trains hauling loads and blaring their horns so loudly, it defied imagination. Dionysus would wake up, sit upright, and gesture infuriated at the trains. "Nothing in the world makes that much noise!! That's just ridiculous! Don't you know there are people down here in the ditch trying to sleep?!" We laughed at this till the tears came.